The problem with trying not to take things for granted is it implies taking them for not-granted, and what is that? Imagining not having them? Imagining them being hard to come by? A bathtub of guilt for having them, maybe. So get in and bathe. Make you clean, it will, if you use enough of it. No. The point isn't to feel guilty about what you have, or what's easy to come by. 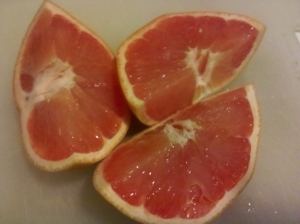 I chopped up this grapefruit, and it was Oh So Good. All full of grapefruity yumminess. The essence of grapefruit, for the taking. My taking. Mine to slice, mine to greedily consume, messy and juicy and mine. To take something for granted is to take it for nothing. To take it for itself, whatever it is, now in this moment -- that's not nothing. That's something. That's the fullness of grapefruit, and it has something to do with living.